For one evening, locals could play a game of bocce ball to support the East Oakland Boxing Association. In a distinctive partnership, Uptown’s Make Westing bar held a 12-team bocce ball tournament fundraiser for EOBA. The East Oakland Boxing Association is a non-profit, community based organization that has provided education, enrichment and health programs for youth since 1987. The EOBA focuses on providing programs that are engaging and fun for children and young adults ages 5 – 20. The benefit match raised $3,304 for the kids Thursday, Nov. 21. Popular in Mediterranean countries and among immigrant communities in the Bay Area, bocce is a game in which players throw or bowl brass or plastic balls down a rectangular court to knock aside rival balls. The boxing association’s mission is to provide a safe and nurturing environment in which youth can feel secure as they achieve success in school, learn life skills, and build self-esteem. Year-round programs offered at the EOBA include academics, gardening, physical education, and youth leadership. “There aren’t many things in East Oakland for youth to do,” said Sarah Chavez, the executive director at the EOBA, adding the program is unique because it serves not just children but also young adults. Located across the street from the historic Fox Theater, Make Westing is furnished with two indoor bocce courts. Co-owner Glenn Kaplan, an East Oakland native who also serves on the board of directors of the East Oakland Boxing Association, is a tireless booster for his hometown. 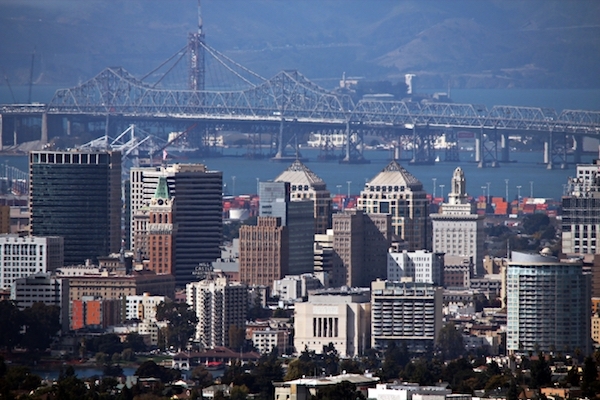 “East Oakland gets associated with too many bad things,” Kaplan said. “This event is something positive and was an opportunity for me to get involved. Chavez and Kaplan’s bocce ball tournament drew about 48 competitors. Each team consisted of four players and paid a $200 registration fee to enter the tournament. Proceeds of the tournament and half of the bar’s signature cocktail sales were donated to the boxing association. The Oaklandish boutique designed a grey EOBA t-shirt to be sold at the fundraiser as well. Despite being a deep-rooted Italian game most often played outdoors, the bar’s small indoor bocce ball courts are available to patrons for free and on a first-come, first served basis. Kaplan said the idea for the courts came while he lived in Brooklyn, New York. One of the players in the tournament was Bruce Stewart, the president of the board of directors at the EOBA. Stewarts’s team, dubbed “Bruce Bruce,” made it to the second round. Aside from providing the community and needy families with free meals, the East Oakland Boxing Association aims to help as many disadvantaged youth as it can. “Things are really good right now. We reached our enrollment capacity for our programs. We have a daily attendance of about 60 youth,” Chavez said, adding that she’s always seeking fresh volunteers and funding for her programs. A bocce ball tournament fundraiser was held at the Make Westing bar in Oakland’s Uptown district. The event raised funds to help support youth programming at the East Oakland Boxing Association on Thursday, Nov. 21. Make Westing, a bar at 1741 Telegraph Ave. in Oakland, has two indoor bocce ball courts. A total of 48 players (12 teams) competed in the bocce ball tournament. Bocce ball courts are available to patrons for free and on a first-come, first served basis at Make Westing.